Development of accurate classification of cavitation types, as well as any classification, has to be based on a choice of general summary classification signs. For example, it can be different by constructive signs of work parts, by character of a course of process, by cavities types and other general classification signs. In present time distinguish the following types of cavitation: static, centrifugal, nozzle, slot-hole, jet, forced, thermal, steam, gas and etc… The static is created at a flow of not movable established cavitator by a liquid stream at a speed in a crack between it and the case over 12-16 m/s for water with normal temperature. The dynamic arises at rotation in liquid impeller, screws, impeller mixers and other impeller mechanisms. The alternating mode is characteristic a separation of cords from a cavitator with the subsequent their disintegration. The centrifugal is created in devices like Rotoclean, vortex pipes, centrifuges, rotational devices. The nozzle arises in narrow sections of a nozzle at course of liquid stream with critical speeds. The slot-hole is formed in gaps between a rotor and stator at gap size less than 0,15 mm. The jet will arise at flow streams of liquid plates, in the flooded and free streams behind streamline restriction, in counter streams in pipes and cases, at a flow of free streams plates. The compulsory is initiated by inflation of air and characterized by emergence of ventilated cavities. Thermal arises in a liquid stream under the influence of a temperature overheat. Steam and gas are types of compulsory cavitation. This division is purely conditional and isn’t united by one general classification sign; however it is very useful for practice. Also there are still other types. Hydrodynamic t can be combined in devices of rotational type, hydrodynamic alarms, vibrators, with ultrasonic cavitation for better boost of action. Technological use of cavitation is based on a number of the effects arising in various stages. Owing to “return” effect of the hydrodynamic layer connected with acceleration of boundary with a cavity of layers of liquid, wave formation, pulsations of cavity volume, sputter liquids by cavitator edge. The cavities which were formed at disintegration, small cavitational bubbles when they explode, generate shock waves in liquid which cause local pressure to 10000 atm, and being formed a stream gather speed to 700 m/s at an explosion of bubbles. Explosion of bubbles generates the strong cumulative effects connected with destroying action against, which there are no resistant materials. And these cumulative effects can be used with big efficiency in processes of dispersing, suspending, and homogenization. All this processes are possible with hydrodynamic cavitation with small expenses of energy. Moreover, owing to allocation of internal energy under the influence of cumulation the coefficient of energy transformation, for example, in heat generators can far exceed 100% and reach 1100% at the expense of nuclear processes in the solutions which created under cavitation influence. All these fineness, which relates to cavitation, define prospects and efficiency of cavitational equipment use and technology in a national economy, industries, energy and transportation field. 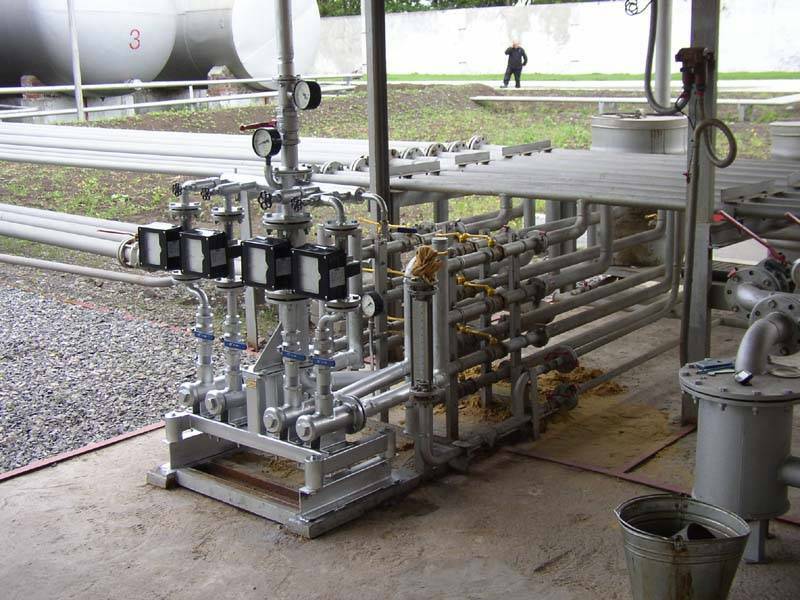 GlobeCore Blending Systems is based on cavitation process; it is used for mixing of any types of liquids in a stream. Installation is intended for blending from two to five separate components, in particular low-octane gasoline with additives and other components. During mixture process in the line mixer the expense of each component is constantly regulated for the purpose of providing at the exit from a mixing collector of a ready-made product with stable quality indicators according to the set compounding. If you want to reduce expenses of you company for mixes production, “USB” cavitation blending system could help you to do that. To receive extra information contact us and technical manager will call you back or download inquiry list and receive free catalog.